Nothing says luxury like a Lexus. Since 1989, Toyota has been putting these high end driving machines onto the streets of the Evansville area, and for just as long, Menke’s has been proud to service them. We know what a Lexus can mean to its owner. From lush interiors to state of the art computer systems, driving a Lexus represents owning top of the line technology. We believe that repairing a Lexus demands the same level of polish and dedication to quality. 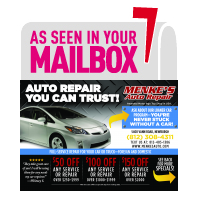 Menke’s is fully equipped with the best machinery possible to repair this luxury offshoot of Toyota’s vehicle line. In fact, we can repair just about any car. Once every three months, the Menke’s staff is trained and updated on the newest diagnostic equipment available. Part of this training is specially devoted to the Lexus. That means that from computer reprogramming to high level maintenance, the technicians at Menke’s are always ready to tackle any problem that a Lexus can encounter. We train and operate on repair equipment including the same factory certified machinery that’s used by Lexus dealers. Menke’s dedication to technology and preparing for perfection means that your luxury sedan or SUV will exit the shop in like-new condition. Even if you’re towed in with a wreck, you’ll always drive home in style. The automotive technicians working on your car are the best in the area. With over one hundred and fifty years of combined experience, all of our mechanics and repair professionals are ASE certified to work on your Lexus and other foreign cars. Menke’s itself has been honored with the ASE Blue Seal of Excellence, and is the only AAA Approved Auto Repair Facility in the area. We’re proud members of the Automotive Service Association, and were awarded the distinction of being Motor Age Magazine’s Top Shop in the nation in 2009. There is simply no place better to service your luxury vehicle. Our passion for perfection doesn’t stop in the garage. When you repair your Lexus at Menke’s, you’ll get a free loaner car to get you out and onto the streets again as fast as possible. Combine this with the home-like comfort of our luxury waiting room, free wifi, and full cable television, and Menke’s Automotive is your ideal destination for any and all Lexus repair needs.